Engraving is the process of cutting lines and designs into the surface of a piece of metal. 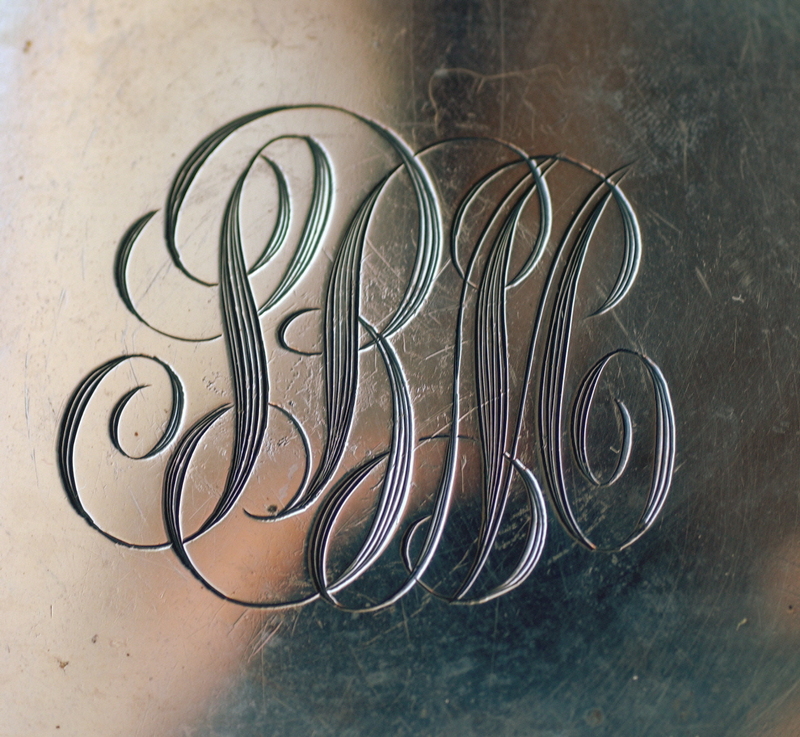 The technique can be used either to create decorations and monograms, or to create a picture on a metal plate, which can then be used for printing. If you wonder what a picture that is printed from an engraved metal plate looks like, take a look at any dollar bill. This is a picture of an engraved monogram on a tray that belonged to my grandmother. This piece would definitely have been engraved by hand. If you look closely you can see where each cut starts and ends and how multiple cuts are used to form each portion of a letter. I’ll be focusing on the traditional engraving techniques. Modernly there are machines, some controlled by computers, that can do engraving all by themselves and an assortment of semi-automated pieces of equipment for use by individuals. In traditional engraving, the tool that is used is called a graver or burin. The graver is made of hardened tool steel and has a long shank that fits into a wooden handle. The length of this shank is actually cut to fit the hand of the individual engraver. The graver is basically a very sharp, tiny knife-edged cutter, with a specially shaped wooden handle. This handle allows extreme control over the amount of pressure that you use and the direction of the cut. The handle is NOT hammered on, but rather is held in the palm of the hand. The variation in the size and shape of the cuts is accomplished by a combination of the shape of the graver cutting edge and the position in which the graver is held. The graver actually removes tiny curls of metal from the metal plate. This picture demonstrates the difference in the shapes of just a few gravers, and even the differences in handle shapes. The top graver shows what it looks like before it is cut down and set into a handle. Gravers must be sharpened on a regular basis. There are special holders available to assure that the graver is held at a very specific angle when it is sharpened. A dull graver, like a dull knife, is dangerous. It makes you push harder in order to cut and it is much more difficult to control the tool if you are pushing hard. The piece of metal that is being engraved must be held very securely so that the graver doesn’t slip and mar the surface. The traditional technique for holding the metal is to stick it to the top of a handle with a small platform called a shellac stick. The piece is heated gently, along with the shellac, and then they are pressed together. Modernly there are new thermo-plastic materials that can be used to do the same job without leaving a residue on the piece that needs to be cleaned off. Thermo-plastic is a material which becomes moldable like clay when it is placed in hot water. It can be re-used virtually indefinitely. If the metal is three dimensional, such as a ring, it may also be put into some sort of vise that will not mar the surface of the piece. Obviously this will only work for small pieces. Larger pieces can be placed into a metal gravers’ ball. These are heavy steel spheres with built in vice jaws on top and a donut shaped pad. This pad allows the sphere to be rotated to any angle for working. Pieces that are too large for any of the previously mentioned holding techniques can be held with padded jaw vises, or other padded hold downs. Learning to engrave with traditional tools takes MANY hours of practice and a very steady hand. I hope that this brief summary gives you some insight into the complexity of the process. This entry was posted in Metal Working by Eirny. Bookmark the permalink.